شکریه, محمود مهرداد, دمیرجی لو, صادق, سلامت طلب, مظاهر. (1396). تعیین پارامترهای مدل ناحیه چسبناک در مود اول تیر دولبه یکسرگیردار کامپوزیتی با استفاده از روش معکوس. علوم و فناوری کامپوزیت, 4(1), 83-90. محمود مهرداد شکریه; صادق دمیرجی لو; مظاهر سلامت طلب. "تعیین پارامترهای مدل ناحیه چسبناک در مود اول تیر دولبه یکسرگیردار کامپوزیتی با استفاده از روش معکوس". علوم و فناوری کامپوزیت, 4, 1, 1396, 83-90. شکریه, محمود مهرداد, دمیرجی لو, صادق, سلامت طلب, مظاهر. (1396). 'تعیین پارامترهای مدل ناحیه چسبناک در مود اول تیر دولبه یکسرگیردار کامپوزیتی با استفاده از روش معکوس', علوم و فناوری کامپوزیت, 4(1), pp. 83-90. شکریه, محمود مهرداد, دمیرجی لو, صادق, سلامت طلب, مظاهر. تعیین پارامترهای مدل ناحیه چسبناک در مود اول تیر دولبه یکسرگیردار کامپوزیتی با استفاده از روش معکوس. علوم و فناوری کامپوزیت, 1396; 4(1): 83-90. در این تحقیق، رشد تورق در مود اول چندلایه‌های کامپوزیتی پلیمری تک‌جهته با پل‌زنی الیاف بررسی شده است. بدین منظور، مدل‌سازی المان محدود رشد تورق در تیر دولبه یک‌سر گیردار با استفاده از مدل ناحیه چسبناک بر پایه مدل‌های کشش- جدایش انجام شده است. در نمونه‌های DCB، نرخ رهایی انرژی کرنشی با افزایش طول تورق در حین رشد ترک افزایش می‌یابد و این باعث می‌شود تا مدل‌های ساده کشش- جدایش، مانند دوخطی توانایی پیش‌بینی دقیق بار- جابه‌جایی این نمونه‌ها را نداشته باشند. به‌منظور رفع این نقص، مدل‌های کشش- جدایش چندخطی معرفی می‌شوند. 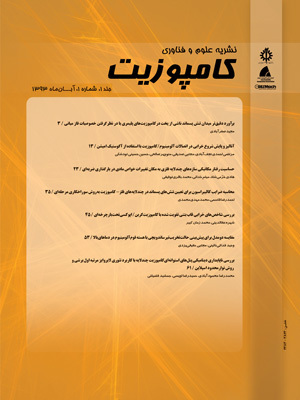 در این تحقیق با استفاده از کمینه نمودن اختلاف نمودار بار- جابه‌جایی حاصل از المان محدود و آزمایشگاهی نمونه DCB، پارامترهای مدل ناحیه چسبناک با استفاده از الگوریتم ژنتیک بهینه‌سازی می‌شوند. نتایج عددی حاصل از مدل‌سازی المان محدود با استفاده از مدل ناحیه چسبناک چندخطی ارایه شده در تحقیق حاضر، با نتایج آزمایشگاهی محققین دیگر مقایسه شده است. نتایج عددی نشان می‌دهند، مدل ناحیه چسبناک چهار خطی ارایه شده، حداکثر تنش پل‌زنی مستخرج از داده‌های آزمایشگاهی و همچنین رفتار تورقی نمونه تیر دولبه یک‌سر گیردار را به‌ خوبی پیش‌بینی می‌نماید. In this study, delamination growth in mode I loading of unidirectional laminated composites with R-curve effect was investigated. To this end, a finite element simulation of delamination growth in double cantilever beam (DCB) performed using the cohesive zone model (CZM) based on traction-separation laws. By increasing the delamination length in DCB specimens, the strain energy release rate increases and for this reason the simple traction-separation law such as bilinear are not capable to predict the load-displacement curve of this specimens accurately. To solve this shortcoming, cohesive zone models with multi-linear traction-separation laws were proposed to predict delamination behavior of the DCB specimens numerically. Afterwards, by minimizing the difference between experimental and numerical load-displacement curves using optimization method based on genetic algorithm, cohesive zone parameters are characterized. A comparison of the results obtained by cohesive laws with experimental data show that four-linear cohesive law can predict the maximum bridging stress as well as the experimental load-displacement curve accurately. ASTM Standard D5528-94a, Standard Test Method for Mode Inter-Laminar Fracture Toughness of Unidirectional Continuous Fiber Reinforced Polymer Matrix Composites, Philadelphia, PA, 1994. Rybicki, E. F. and Kanninen, M. F., “A Finite Element Calculation of Stress Intensity Factors by a Modified Crack Closure Integral,” Eng. Fract. Mech., Vol. 9, No. 4, pp. 931–938, Jan. 1977. Nairn, J. A., “Analytical and Numerical Modeling of R -Curves for Cracks With Bridging Zones,” Int. J. Fract., vol. 155, No. 2, pp. 167–181, 2009. Williams, J. G. Hadavinia, H. and Kinloch, A. J., “Cohesive Zone Models in The Characterisation of Toughness,” Compos. Sci. Technol., Vol. 3, 2005. Alfano, G., “On The Influence of The Shape of The Interface Law on The Application of Cohesive-Zone Models,” Compos. Sci. Technol., Vol. 66, No. 6, pp. 723–730, May 2006. Dugdale, D. S., “Yielding of Steel Sheets Containing Slits,” J. Mech. Phys. Solids, Vol. 8, No. 2, pp. 100–104, May 1960. Barenblatt, G. I., “The Mathematical Theory of Equilibrium Cracks in Brittle Fracture,” Compos. Sci. Technol, Vol. 3, pp. 55–129, 1962. Camanho, P. P. Davila, C. G. and De Moura, M. F., “Numerical Simulation of Mixed-Mode Progressive Delamination in Composite Materials,” J. Compos. Mater., Vol. 37, No. 16, pp. 1415–1438, 2003. Turon, A. Dávila, C. G. Camanho, P. P. and Costa, J., “An Engineering Solution for Mesh Size Effects in The Simulation of Delamination Using Cohesive Zone Models,” Eng. Fract. Mech., Vol. 74, No. 10, pp. 1665–1682, 2007. Dávila, C. G. Rose, C. A. and Camanho, P. P., “A Procedure for Superposinglinear Cohesive Laws to Represent Multiple Damage Mechanisms in The Fracture Of Composites,” Int. J. Fract., Vol. 158, No. 2, pp. 211–223, 2009. Heidari-Rarani, M. Shokrieh, M. M. and Camanho, P. P., “Finite Element Modeling of Mode I Delamination Growth in Laminated DCB Specimens With R-curve Effects,” Compos. Part B Eng., Vol. 45, No. 1, pp. 897–903, 2013. Sorensen, B. F. and Jacobsen, T. K., “Large-Scale Bridging in Composites: R-Curves and Bridging Laws,” Compos. Part A Appl. Sci. Manuf., Vol. 29, No. 11, pp. 1443–1451, 1998. Shokrieh, M. M. Salamat-talab, M. and Heidari-Rarani, M., “Effect of Initial Crack Length on The Measured Bridging Law of Unidirectional E-Glass/Epoxy Double Cantilever Beam Specimens,” Mater. Des., Vol. 55, pp. 605–611, 2014. Farmand-Ashtiani, E. Cugnoni, J. and Botsis, J., “Specimen Thickness Dependence of Large Scale Fiber Bridging in Mode I Interlaminar Fracture of Carbon Epoxy Composite,” Int. J. Solids Struct. Vol. 55, pp. 58–65, 2014. Manshadi, B. D. Vassilopoulos, A. P. and Botsis, J., “A Combined Experimental/Numerical Study of The Scaling Effects on Mode I Delamination of GFRP,” Compos. Sci. Technol., Vol. 83, pp. 32–39, 2013. Manshadi, B. D. Farmand-Ashtiani, E. Botsis, J. and Vassilopoulos, A. P., “An Iterative Analytical/Experimental Study of Bridging in Delamination of The Double Cantilever Beam Specimen,” Compos. Part A Appl. Sci. Manuf., Vol. 61, pp. 43–50, Jun. 2014. Dourado, N. De Moura, M. F. S. F. De Morais, A. B. and Pereira, A. B., “Bilinear Approximations to The Mode II Delamination Cohesive Law Using an Inverse Method,” Mech. Mater, Vol. 49, pp. 42–50, 2012.
 de Morais, A.B. Pereira, A.B. de Moura, M.F.S.F. Silva, F.G.A. Silva Dourado, N., “Bilinear Approximations to the Mixed-Mode I–II Delamination Cohesive Law Using an Inverse Method,” Compos. Struct., Vol. 122, pp. 361–366, 2015. Blackman, B. R. K. Hadavinia, H. Kinloch, A. J. and Williams, J. G., “The Use of a Cohesive Zone Model to Study The Fracture of Fibre Composites and Adhesively-Bonded Joints,” Compos. Sci. Technol., Vol. 1, pp. 25–46, 2003. Salamat-talab, M., “Simulation Of Delamination Growth In Double Cantilever Beam Specimen Made Of Laminated Composites” MSc Thesis, Department of Mechanical Engineering, Iran university of Science and Technology, 2011.